AUSTIN – (May 6, 2015) – The Texas Water Development Board (TWDB) announced today the recipients of its annual Texas Rain Catcher Award, a rainwater harvesting competition and recognition program. RainDrop Harvesting Solutions won the award in the Educational category for its efforts to bring water conservation technologies to the Brazos Valley. The TWDB’s Texas Rain Catcher Award recognizes excellence in the application of rainwater harvesting systems in Texas, promotes rainwater harvesting technology, and educates the public on this important water-saving practice. RainDrop Harvesting Solutions was founded in 2013 by Kathie Hitt and Henry Luna. The two have a mutual passion for designing and building rainwater harvesting systems and sharing their knowledge with others. RainDrop Harvesting Solutions uses a mobile demonstration unit to spread the word about water conservation and rainwater harvesting in a fun and memorable way to kids and adults alike. 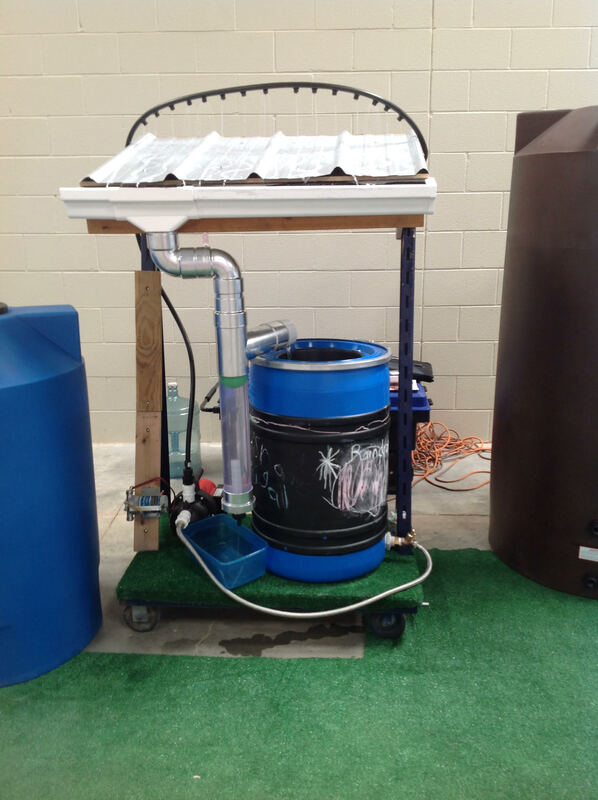 The demonstration uses an electric pump to recirculate rainwater through each component of a rainwater harvesting system. In addition, the demonstration features a tank coated in chalkboard paint that encourages children to write or draw on the tank as they learn about rainwater harvesting and water conservation. The portability of the demonstration has allowed Kathie and Henry to travel to schools and events throughout the Brazos Valley. The Texas Rain Catcher Award competition began in 2007 and is open to all individuals, companies, organizations, municipalities, and other local and state governmental entities in Texas. It recognizes entities and individuals in the rainwater harvesting community and beyond and establishes award recipients as dedicated water conservation leaders in Texas. RainDrop Harvesting Solutions is one of five awardees being recognized statewide this year. Based on a mutual passion for water conservation, RainDrop Harvesting Solutions is a local small business located in College Station serving the Brazos Valley’s water needs. The company was started in 2013 by Kathie Hitt (Aggie, class of ’90) and Henry Luna and is dedicated to serving the public through education as well as utilizing the most current and best practices in water conservation. The company designs and installs rainwater harvesting systems and offers an array of water services to meet each customer’s unique needs. For more information about RainDrop Harvesting Solutions please visit www.raindropsavers.com. Categories: Uncategorized | Tags: Brazos Valley, College Station, Education, Press Release, Rainwater Harvesting, Texas Rain Catcher Award, Texas Water Development Board, TWDB, Water Conservation | Permalink.